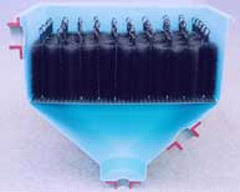 Black Knight filter brushes are made from the very highest quality Hydrotek polypropylene twisted into two stainless steel wires to form a cylindrical brush with a loop at one end for hanging. The other end is capped with a plastic knob for safety. What are the benefits of Black Knight filter brushes?